Today's card is a sympathy card. It's always a hard card to make, but most especially when it it for a friend whose child has passed. No matter what age they are when a child passes it is hardest to imagine. Recently a high school classmate's daughter passed away. She was only 19. A brilliant, beautiful girl, taken too soon. My heart and prayers go out to my classmate and his family. My card takes a full 8.5 x 11 inch sheet of black cardstock cut in half at 5.50, and one piece cut at 5.50 x 3 inches. Score & fold one half piece of carsstock at 4.25 inches and set it aside. Then score and fold the other half at 2 inches, 5 inches and 7 inches. Mountain/Valley fold this piece of cs. Score and fold the 5.50 x 3 inch piece in half at 1.50 inches. Assembly is pretty simple at this point. Take the 5.50 x 3 inch piece of cs and adhere 1.50 inch flap to the back of the base card (5.50 inches x 8.50 inches) leaving the other flap free. Adhere that free flap to the other 5.50 x 4.25 piece of carstock, joining them as one long base of 22 inches x 5.50 inches. Now you can stamp and decorate as you wish. The card I created below is entered in the challenge at Christmas Card Throwdown -- Nov Colour. Coloring - Ranger Distress Oxides, Stampin' Up! Write N Markers, Aqua Painter. 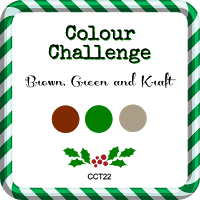 Below is the colour badge for this challenge. 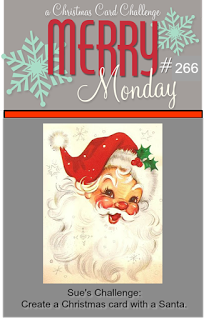 Today I am featuring the card I created for the Merry Monday Christmas Card Challenge #266 Santa Clause. For my card I used the Vintage Santa stamp from Stampabilities. The sentiment is a die from Peachy Cheap. To add some color to my stamped image I used Distress Oxide inks on a cotton swab. 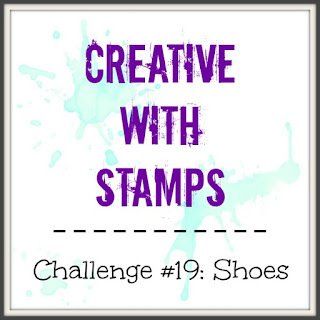 The stamped background is En Francais from Stampin' Up! Labels: Challenge, Distress Oxides Ink, En Francais, Merry Christmas, Merry Monday Christmas Card Challenge, Peachy Cheap, Santa, Stampabilities, Stampin' Up! Ok, so I was on Pinterest today and I came across these pillow boxes that were sooo stinkin' cute, I had to turn them into greeting cards. I couldn't go to the blog but the lady's name is Therese Hoffman. Her pillow boxes were adorable!!! So below is my set of cards and then pictures of each individual card. Left to right : Elf, Frosty, Rudolph, and Santa. My sweet friend Monika sent me the link to play along with this challenge. Thanks Monika! I only have this boot stamp. I'm not a "shoe" person per say. But I do like Stamping and coloring thus rubber boot stamp (Falling Fall #PPAUG1602) from Marcella Harley at Power Poppy. The image was stamped with basic black and heat embossed with clear embossing powder. This helps keep the different colors separate. It was painted with Tim Holtz Distress Oxides inks and an aqua pen. 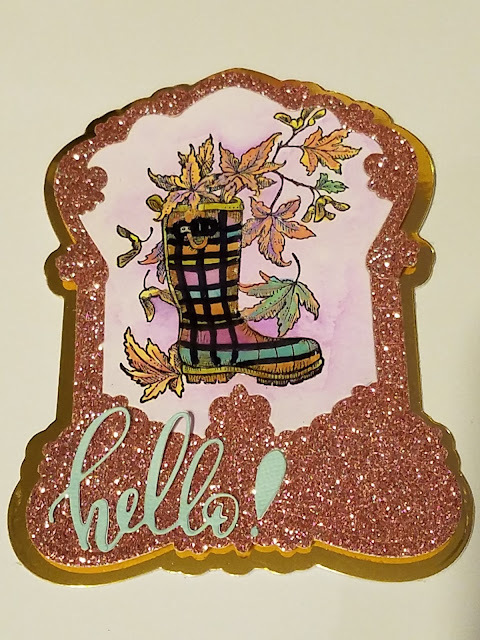 Pink glitter paper is Stampin' Up! Hello die is from Spellbinders KOTM. The glitter paper, the gold back frame and the image were all cut using Marianne's Designs Frame. I won an Honorable Mention for this card!!!! Thanks to the DT at Creative With Stamps.